It’s a fantasy and a trickster story, set in the very first days of the human race, when Homo sapiens is just a few scattered, struggling tribes. The trickster god, Mantis, chooses a very reluctant young man, Nudur, as his representative and pawn, and sends him out on a quest that could save his people. I think it started with the desire to write an epic-ish fantasy tale, with magic and warring gods and mortals caught between them. I didn’t want to set it in the contemporary world, and then I tried on the idea of setting it in a medieval world but I didn’t think I’d have much that was new to say about that, so I kept pushing back it into older and older eras, until I tried fitting it into the very beginning of humanity, and that suddenly felt like a nice rich vein. Likewise, I knew I wanted to avoid the trickster as a coyote or a spider. This world really started to come together when I chose the culture of the hunter-gatherers of the Kalahari as the starting point for Nudur’s people, since it’s one of the oldest on the planet. And, they have a trickster god named Mantis. And, they hunt big game with little poisoned arrows. I’m a tour guide in the American Museum of Natural History. The Spitzer Hall of Human Origins, which discusses what the fossil record shows us about human evolution, is one of my favorite places to take visitors. Pretty much everything in there is a writing prompt for a great story, and I felt like it’s been demanding to be used for a long while now. 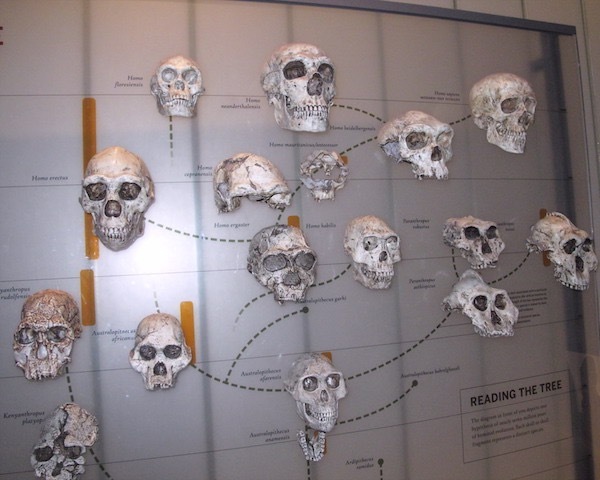 The AMNH’s Hall of Human Origins was my single greatest source, and it provided the idea for the story’s main conflict. The center of the hall is dedicated to dramatic dioramas of various hominids recreated from the fossil record, but what I think is one of the most important exhibits is off to the side and very easy to miss. When human evolution comes up in popular culture, it tends to get abbreviated so that we imagine it as a straight linear progression towards our own familiar form – we start with something ape-like, and then we picture some developments like standing more and more upright, and getting progressively weaker and smarter and less hairy, so that every change is something that moves one step closer to ourselves, until we get to modern humans and we’ve reached the goal and we’re done. (Or, maybe since humanity is fated to continue to get weaker and smarter, we’ll go on to become hairless stick figures with giant pulsating brains.) But that’s not the way it happens at all. On the wall of an alcove in the Hall of Human Origins there are seventeen or eighteen skulls representing various hominid species that lived over the last seven million years. It’s a timeline, though it doesn’t look like one. It looks more like a twisty, confusing family tree, with many different branches and lots of dead ends. What it shows us is that over the last seven million years or so, there have almost always been multiple hominid species living on Earth at any given time. We know there have been long stretches where there were more than four types of hominids at a time, each evolving in different directions and developing different traits and strengths. (This went on until surprisingly recently – for example, Homo floresiensis, which is nicknamed the Hobbit, is a distinct species that lived in Indonesia less than 18,000 years ago.) We have evidence that in some cases they met and interacted with each other. The primary conflict in “The Mantis Tattoo” is about an encounter between two of these species. They have a lot of things in common; unfortunately, one of them is that neither species plays well with others, and they’re both competent enough to do something about it. The Fathers in this story are based on Homo heidelbergensis. They are a species that originated in Africa and dispersed into several populations, some of which were much taller and broader than modern man. It’s thought that some of them migrated out of Africa and a branch of their descendants evolved into Neanderthals. The descendants of the ones who remained in Africa eventually evolved into Homo sapiens. Various short stories. There’s enough material in the world of Mantis and Nudur that I would like to revisit it, though I expect that will turn out to be a very different type of story than this one. “The Mantis Tattoo” appears in the March/April 2015 issue of F&SF.